Palm's ENtank™ electroless nickel plating systems are the highest quality available, and are supplied complete and ready to operate. They are available either with solid stainless steel construction (to be used with the ENstat II anodic passivation system) or with a polypropylene liner in a stainless steel shell. Only extra low carbon grade Type 304L or 316L stainless steel is used to guarantee complete resistance to nitric acid. Likewise, the polypropylene is stress relieved, virgin material, welded or extruded with copolymer rod under an inert atmosphere to ensure even expansion and freedom from defects. These techniques, while more expensive than others, significantly extend the life of electroless nickel systems. 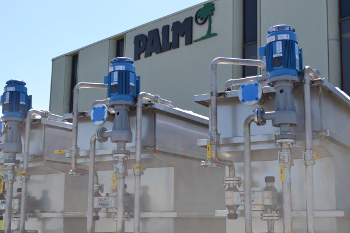 The quality that Palm provides helps ensure that their equipment will provide many years of reliable service. Each ENtank™ includes an air spider, a sealless vertical centrifugal pump, either an external ENheat™ heat exchanger or stainless steel electric immersion heaters, and filter bag holders, with all necessary piping and valves. Systems and replacement liners are available can can be fabricated in any size. Special designs in any size for special applications with external filter chambers, sloped bottoms, or solution agitation can also be fabricated. 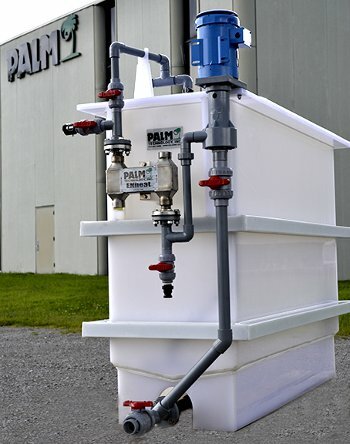 Palm also fabricates stainless steel and polypropylene tanks for electrolytic plating and for pretreatment. They are designed for ease of operation, flexibility, and freedom from maintenance. These tanks receive the same care and attention that is given to electroless nickel plating tanks. Only 1/2 or 3/4 inch thick sheet is used to fabricate polypropylene tanks, and all seams are triple welded and spark tested at 20,000 volts. In addition, the side walls of plastic tanks are often reinforced with steel angle, painted and encapsulated with 1/4 inch thick polypropylene covers. Stainless steel tanks are also built from Type 304L sheet with formed lips and girths. Single, double and triple counterflow rinse tanks, complete with overflow weirs, water inlet spargers and air spiders, are standard.